Glycans play critical roles in many biological processes, and their structural diversity is key for specific protein-glycan recognition. GS-align is a novel computational method for glycan structure alignment and similarity measurement. 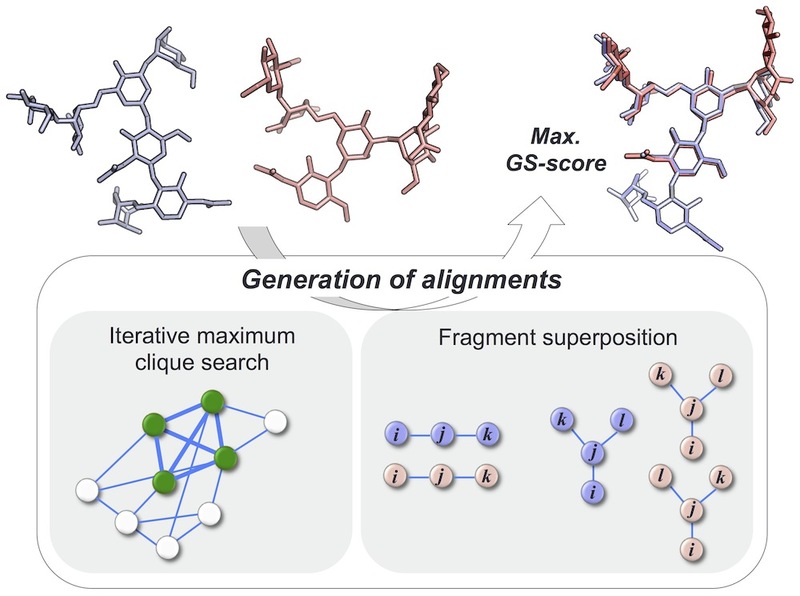 GS-align generates possible alignments between two glycan structures through iterative maximum clique search and fragment superposition, and the optimal alignment is determined by the maximum structural similarity score, GS-score whose significance is size-independent. Click here to download the GS-align software package including example PDB glycan structures. Input glycan structure files for GS-align must be in PDB format and be ended with "TER". Users can prepare an input structure by manually extracting the glycan coordinate data from a PDB file. We also recommend use of Glycan Reader (http://www.charmm-gui.org/input/glycan), which is our web-based tool for automated glycan identification and simulation preparation (Jo et al. J. Comput. Chem. 2011, 32: 3135-3141). GS-align needs information on which glycosidic oxygen is linked to which residue for the calculation of GS-score. However, it is not easy to manually assign the glycosidic oxygen information only based on the context in the PDB file. The GS-align software package contains an auxiliary program (AssignOGAtoms.java) to automatically assigned the glycosidic oxygens after renumbering the residue sequences.